It was all a big Soviet lie. Not one space rocket could they make. But they tricked every Western spy. Whenever they tried they could only get 5 feet high. 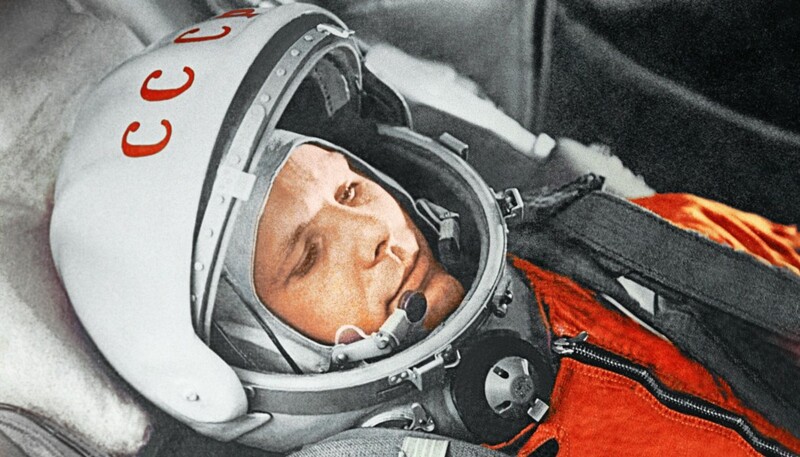 Soviet Cosmonauts could not fly. 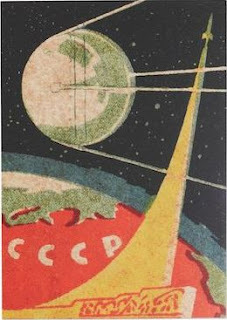 Whilst it was meant to poke a bit of fun at the fallen prestige of former USSR, with a knowing nod towards the conspiracy theories that claimed NASA’s Apollo Moon landings were faked, I was in fact deeply interested in all the revelations which were then slowly emerging about what life was like in Soviet Russia. There had been so much secrecy and speculation up to that point, particularly about the space race of the 1950s and 1960s. 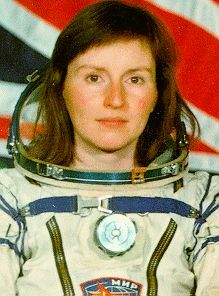 Yet in the last few years of the Soviet era, Glasnost and Perestroika had meant we saw regular reports on the TV about missions to the Soviet Space Station Mir – not least when the first British Astronaut, Helen Sharman, took part in a mission to the Space Station in 1991. I remember I also followed the reports on TV about Cosmonaut Yuri Romanenko (pictured right), who spent almost a year on Mir – at that time the longest continuous period any human had so far spent in space. 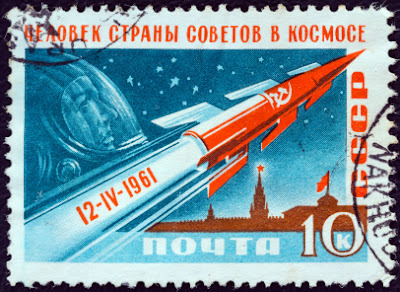 Despite all the achievements and all the historic firsts of the Soviet Space programme there seemed to be something very makeshift about it all. When compared to the slick operation which was NASA, with its regular launches of its reusable Space Shuttle launching satellites such as the Hubble Space Telescope, the old Soviet Soyuz capsules bouncing back down in the wilds of Kazakhstan still seemed all very Heath Robinson. 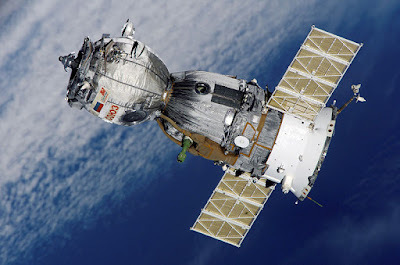 It’s amazing to think that now, with the US Space Shuttle fleet all retired, the Soyuz spacecraft which was first devised in the 1960s is still the most tried and tested way of getting humans into earth orbit, indeed, it's now the only way. Naturally, when a friend of mine who works at the Science Museum here in London told me that they were going to put on an exhibition titled – Cosmonauts: Birth of the Space Age (closes March 13th 2016), I knew it would be an exhibition I’d definitely want to see. And it certainly does not disappoint. In fact it really is quite a remarkable event and one not to be missed by anyone with even a passing interest in space exploration. 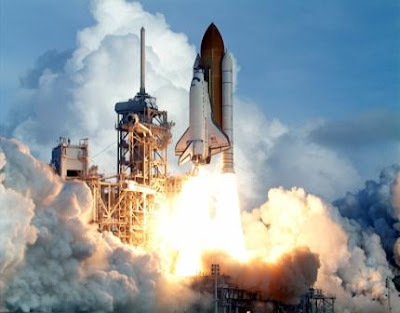 Like most people my interest in space flight and astronomy, as well as my interest in the science fiction stories of writer’s such as Arthur C. Clarke, Isaac Asimov, and John Christopher, began in my childhood and the fascination has never worn thin since. Hence, I was long familiar with the facts about the American space programme, and not least the pieces of NASA hardware which are on permanent display at the Science Museum which I’d first seen when I’d visited as a child, but I knew I was certainly far less familiar with the story of Soviet spacefarers. Of course, I knew Sputnik (meaning ‘fellow traveller’) was the first artificial satellite to orbit the earth in 1957. 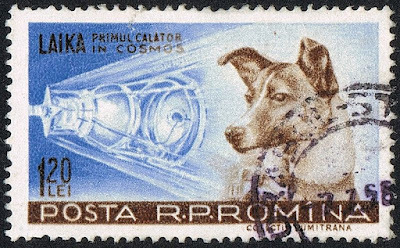 I knew that the Russians were also the first to put a living creature into space – a little dog, called Laika, in Sputnik 2. 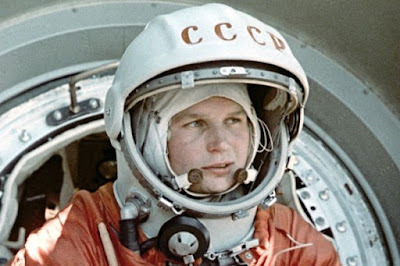 Then the first man in space, Yuri Gagarin in 1961, and, in 1963, the first woman too, Valentina Tereshkova (who officially opened the exhibition at the Science Museum). And, although I had avidly followed the news reports about Space Station Mir in the late 1980s and early 1990s, and I’d felt sad watching the TV News footage as Mir burnt up in the earth’s atmosphere over the pacific when it was finally abandoned in 2001, this exhibition has filled a vast hole in my knowledge concerning the real details of the Soviet space programme, largely, I think, because it had always been over-shadowed by the more triumphal story of their US rivals. This exhibition goes a long way to altering that rather one-sided balance. 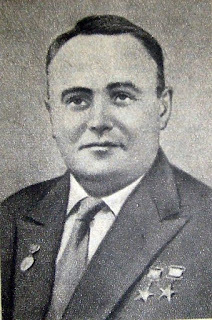 By stark contrast, Sergei Korolev remained almost entirely unknown until his early death in 1966, yet he was the acknowledged ‘Chief Designer’ – the mastermind behind the official Soviet space programme. His identity is thought to have been kept a secret to shield him from Western spies and any possible assassination attempts. 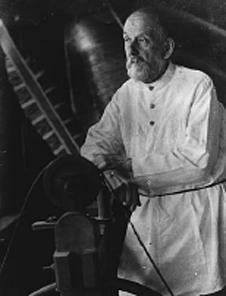 He was the founder of GIRD – The Group for the Study of Reactive Motion, but deemed a dangerous intellectual in the Stalin era, and, like many eminent Russian minds of the period, he was exiled to a prison camp in Siberia, returning from this great hardship to be rehabilitated and have his name duly cleared only after Joseph Stalin’s death in 1953. Korolev’s detention camp photograph and his small tin cup, both displayed in the exhibition, are poignant reminders of the less happy side of Soviet history. 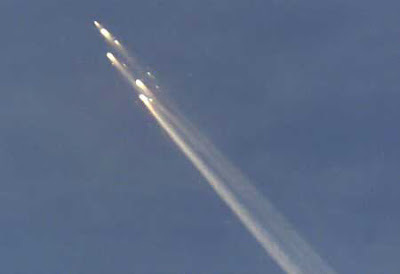 Korolev later went on to mastermind the first satellite launches and the manned spaceflights which defined the scientific achievements of the Soviet Socialist enterprise in the middle years of the twentieth century. A small section of the exhibition looking at the use of animals in early spaceflight research largely skirts around the ethical issues, as well as the realities, of experimenting with sending live animals into space. Not that they presumably had much choice in the matter, “Man’s best friends” are nonetheless described as “brave”, and it is noted that Laika travelled on “a one way ticket.” I recall reading a news article which reported that details had finally been unearthed from long forgotten files and firsthand sources which confirm that rather than sleeping amidst the stars (as it had been claimed at the time) the little dog almost certainly met a much more gruesome end as her spacecraft hurtled through the earth’s outer atmosphere. 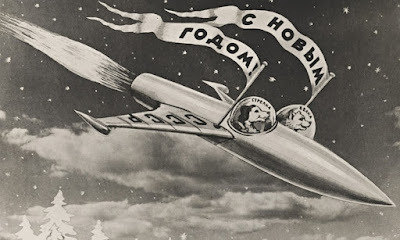 Given that the Science Museum is perennially popular with small children it is perhaps understandable that the exhibition skates around examining this aspect of pioneering spaceflight research in any great detail, giving instead a focus on happier stories of dogs which, like Belka and Strelka, did return safe and well to earth – Strelka even later having a litter of six puppies, one of which (named Pushinka) was given as a gift to John F Kennedy, the President of the United States, and his family by the Soviet Premier, Nikita Khrushchev. Cold War geopolitics, of course, belies the narrative of the exhibition. Sputnik 2, which carried the dog Laika didn’t simply raise public concerns about animal welfare, it also raised great anxiety throughout the US Government – not least because Sputnik 2 weighed over half a tonne, and hence it could well be used to carry a far more significant payload than a little dog, as this was a machine more than capable of carrying a nuclear warhead. It’s no wonder then that the USA, which had almost no significant space programme at the start of the 1960s, famously vowed in a speech made by President Kennedy (which is played here in the exhibition on a lovely old black and white TV set of the period), that it would land a man on the Moon and return him safely back to earth again before the end of that decade. It really is a fascinating selection of objects which the Science Museum has managed to borrow and bring together for this exhibition. It can’t have been easy (I’ve organised sending an exhibition to Russia and I for one certainly know how complex the process can be! 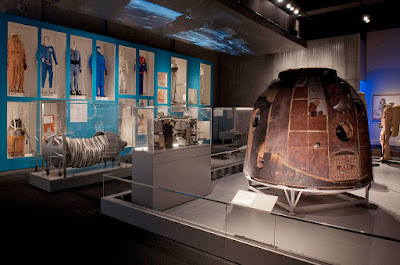 ), especially given the calibre of some of the pieces, such as Tereshkova’s Soyuz landing capsule, plus two unused Luna landing modules (See here for an article detailing the challenges the exhibition team faced). There’s also Helen Sharman’s spacesuit (pictured left). Both Sharman and Tereshkova were the same age, 26, when they each went into space. 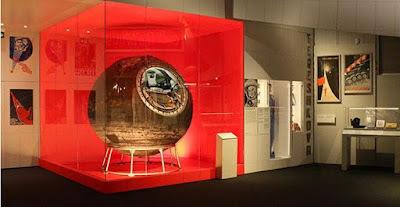 One of the items which I liked the best were the control panels from the Soyuz – you can see the one inside Tereshkova’s capsule – which include a small globe mounted in a glass dome on the control console which the Cosmonauts used to track their position over the earth. Again, it’s this distinctly analogue aspect to the pioneering technology which now gives it all such a quaint yet hair-raisingly Heath Robinson-like reality. We’ve all heard the often quoted fact that there is now more computing power in a modern mobile phone than there was in the original Apollo 11 spacecraft. Yet seeing these machines brings the reality of such things home and attests to the sheer intellectual talent and bravery of these people. Tereshkova, we read, realised soon after reaching orbit that her Vostok 6 spacecraft was wrongly aligned, such that when her braking rocket fired it would have shot her into a higher orbit from which she’d never have escaped, and so, if ground control hadn’t swiftly transmitted new instructions to her on-board computer, she would never have returned to earth at all. Yet the perils faced by such early cosmonauts weren’t always only encountered beyond the earth’s atmosphere. 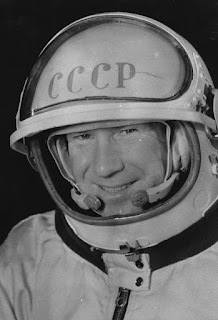 When Alexei Leonov (pictured right), the first man to perform an EVA (extra-vehicular activity) or ‘spacewalk’, and his crew returned to earth their Voskhod 2 spacecraft overshot their landing site by 400 kilometres and so they had to endure two nights in the freezing wilderness of the Taiga forest before they could be safely picked up. Leonov was also an artist who has taken inspiration from his experiences in space, some of his sketches – such as his magical ‘The Rising of the Sun – View from Orbit (18th March 1965)’,as well as some of his coloured pencils and paintbrushes, are also featured in the exhibition. Had the Soviet manned missions to the Moon not been cancelled Leonov would also have been the first Cosmonaut to set foot on lunar soil. 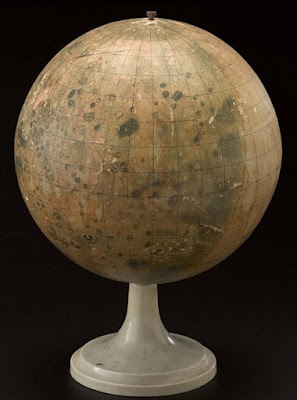 The British connection here is interestingly illustrated too by a globe mapping the far-side of the lunar surface which was produced as a result of the Soviet Luna 3 mission in 1962 and was later presented to the Chairman of the BBC by the Soviet Academy of Sciences. 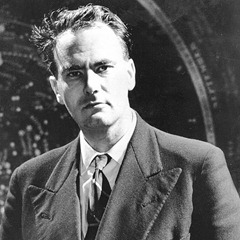 It was used, appropriately enough, by Patrick Moore in an early episode of his long running TV series, The Sky at Night. Patrick’s famously detailed hand-drawn maps of the lunar surface made from his observations at his own telescope had been used by the Soviets in the preparations for their Luna programme missions. I also learnt that Yuri Gagarin’s first overseas visit following his return from space was to Britain. Given the Cold War animosity at that time, he visited at the invitation of the British Union of Foundry Workers (Gagarin himself having been a former foundry worker in Russia), rather than at the official invitation of the British Government. He did meet the Queen, however, and was given an autographed photograph of the Royal Family. 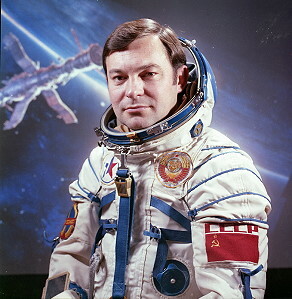 Several decades later, as a further symbol of goodwill between Britain and the USSR, this photograph was taken to space station Mir by Helen Sharman on her mission in 1991, where it was duly stamped with the official seal of the Soviet space station. Given that the key factor in the development of spaceflight was the competition between the USSR and the USA, I'd rather hoped there might have been more information in the exhibition highlighting the USSR's attempt to create a reuseable spacecraft of its own. 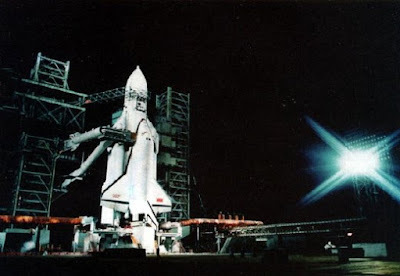 A Soviet equivalent of the US Space Shuttle programme was in development and had even managed to make one successful unmanned test flight into space in November 1988. Not much is really known about the Buran shuttle programme, and, given the striking visual similarity it had to the US Space Shuttles, few people realise that the Buran spacecraft were actually very different machines in terms of design, construction, potential capacity and function. 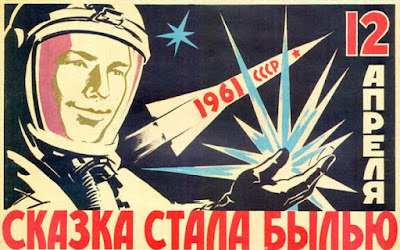 It's even been argued (see here) that had the programme been successfully continued rather than abandoned with the political collapse of the USSR it might have advanced human spaceflight capabilities significantly. If you search the internet there are lots of forlorn photos of the decaying remnants of some of the long forgotten Buran prototypes rotting in derelict hangars, but there is one which has been preserved oddly enough in Germany - it can be seen on display at the Technik-Museum in Speyer (see here). Essentially the exhibition is focussed on the human element of space exploration as much as it is on the technical. It shows how what began in secrecy, arguably as much a propaganda race as a technological race between competing ideologies, moved from being an extension to the programme of advanced ballistics research to one of international accord and peaceful scientific cooperation. 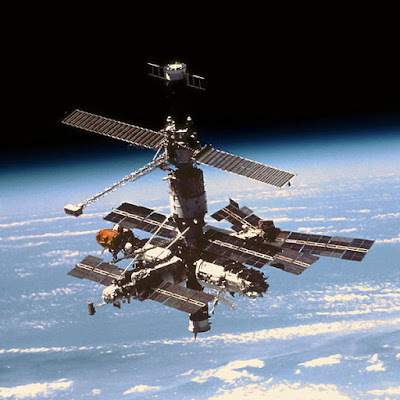 I learnt that the first Soviet space station, Salyut, launched in 1977, was essentially a military one charged with gathering intelligence; whereas Mir, which means ‘Peace,’ launched in 1986, was very much an internationally orientated scientific operation, whose spirit very much lives on in today’s International Space Station (ISS). A few years ago I bought a radio scanner specifically to tune in to the radio transmissions from the ISS. 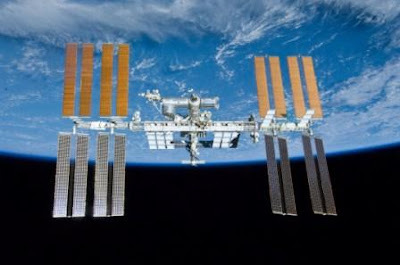 You can, of course, follow and even sometimes communicate with the Cosmonauts and Astronauts onboard the ISS over the internet, but there is still something indescribably special about listening in to the ISS in real time over the radiowaves as you watch its bright dot of light rapidly passing over the clear dome of the night sky. 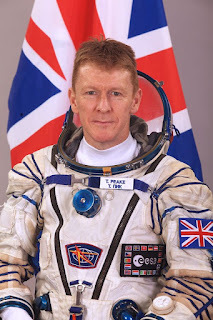 It will be fantastic if I manage to hear Britain’s second Astronaut, Tim Peake, on my scanner at some point over the next seven months whilst he is on-board the ISS (if I do, I shall definitely post a report about it here on the SPA website first).